Jackfruit and Lizards - Study Abroad in India: "Global Entrepreneurship & Innovation"Study Abroad in India: "Global Entrepreneurship & Innovation"
Being on the other side of the globe, India seems very alien at times to me. What I mean by this is the things that grow and live there- plants, animals, and the like. 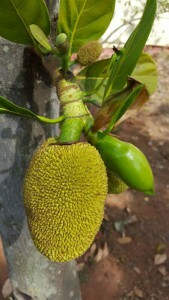 I think one of the oddest plants that I came across was a jackfruit. I have seen them before in Asian food marts, and I think I tasted one (not a fan) but seeing them on trees is very different then in a market. I am a fan of sci-fi so to me, many of the landscapes looked like a different planet at times, and with the red dust my mind wondered to mars often. I also got to see a few different animals, some of which live in the states but are not as common to see on a road. Cows, pigs, chickens, dogs, and cockroaches. The last of which are not too common (well at least where I live. 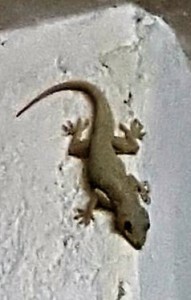 New York is a different story), but the one animal that I was happy to see, and find exciting is lizards. They do not do so well in the colder weather where I live but I’ve always liked them. My teammates are not too fond of them, in fact at 7beans a few of them fall into our seating area and they freeked out. It seems they are considered a pest, but some homes keep them, not exactly as pets but rather tolerate them there because they eat other pests. I also find them rather cute and wish we had them around here. This entry was posted in Uncategorized by brendan_donoghue@student.uml.edu. Bookmark the permalink.